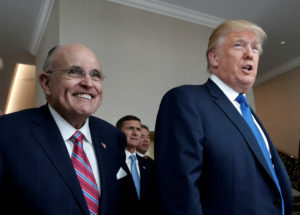 WASHINGTON — Rudy Giuliani says he has repeatedly counseled President Donald Trump against firing Attorney General Jeff Sessions despite the president’s ongoing anger over Sessions’ decision to recuse himself from the Russia probe. Giuliani tells The Associated Press that Trump has asked him multiple times — before and since the former New York City mayor joined the president’s legal team last month — about whether Sessions should have been fired. He says he doesn’t think the president should do it, and says he’s told him so. The former mayor adds that he does not believe Trump will fire Sessions.